Your smile is one of your most noticeable assets. Whenever you walk into a room, your smile will certainly attract other people’s attention and based on what they will see, they will form their own subjective perception about you as a person in an instant. If you smile is not as beautiful as it should appear, then the impression that you might leave them might not be as good. But if you have that stunning, elegant smile, it’s much easier to make that strong, positive first impression. That’s why you should see to it that your smile is always at its finest. This has made Cosmetic Dentistry one of the most in-demand branches of dentistry. Everybody wants to have that ideal smile and the dental treatments under this specialization can give you just that. These procedures are all aimed at improving the aesthetic quality of your face by helping you achieve the smile that you have always wanted. By using the most advanced techniques and modern tools, your trusted dentist in Salisbury and Adelaide here at Parabanks Dental can give your smile a total makeover. Getting a smile makeover does not only improve your aesthetic quality. It can actually do a lot more for you. Aside from enhancing that beauty of your smile and helping you keep that youthful appearance, here are other benefits that Cosmetic Dentistry can give you. Get a smile makeover today and experience all these wondrous benefits. For high-quality Cosmetic Dentistry, consult your trusted dentist in Salisbury here at Parabanks Dental. We can provide you with dental treatments that will help you achieve that perfect smile that you have always wanted. 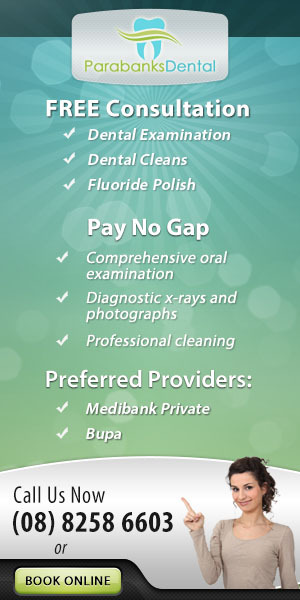 Call us today on (08) 82586603 or simply book your appointment online.